An image of an elliptical galaxy by NASA's Chandra X-ray Observatory has revealed a trail of black holes and neutron stars stretching more than fifty thousand light years across space. The trail of intense X-ray sources is evidence that this apparently sedate galaxy collided with another galaxy a few billion years ago. "This discovery shows that X-ray observations may be the best way to identify the ancient remains of mergers between galaxies," said Lars Hernquist of the Harvard-Smithsonian Center for Astrophysics in Cambridge (CfA), Mass., and a coauthor on an article on the galaxy NGC 4261 in an upcoming issue of The Astrophysical Journal Letters. "It could be a significant tool for probing the origin of elliptical galaxies." "From the optical and radio images, we knew something unusual was going on in the nucleus of this galaxy, but the real surprise turned out to be on the outer edges of the galaxy," said Andreas Zezas, also of CfA, and lead-author of the paper on NGC 4261. "Dozens of black holes and neutron stars were strung out across space like beads on a necklace." The spectacular structure is thought to represent the aftermath of the destruction of a smaller galaxy that was pulled apart by gravitational tidal forces as it fell into NGC 4261. As the doomed galaxy fell into the larger one, large streams of gas were pulled out into long tidal tails. Shock waves generated as these tidal tails fell into the larger galaxy triggered the formation of large numbers of massive stars which over the course of a few million years evolved into neutron stars or black holes. A few of these extremely compact objects had companion stars, and became bright X-ray sources as gas from the companions was captured by the intense gravitational fields of the neutron stars and black holes. The origin of elliptical galaxies has long been a subject of intense debate among astronomers. The currently favored view is that they are produced by collisions between spiral galaxies. Computer simulations of galaxy collisions support this idea, and optical evidence of tails, shells, ripples, arcs and other structures have been interpreted as evidence for this theory. However the optical evidence rather quickly fades into the starry background of the galaxy, whereas the NGC 4261 X-ray observations show that the X-ray signature may linger for hundreds of millions of years. NGC 4261 is approximately 100 million light years away from Earth. 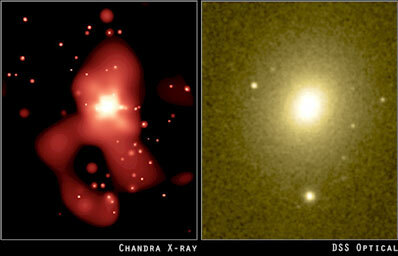 The data for these results were taken from the Chandra archive. NGC 4261 was originally observed with the Advanced CCD Imaging Spectrometer on May 6, 2000. Other members of the research team were Pepi Fabbiano and Jon Miller, both from the CfA.